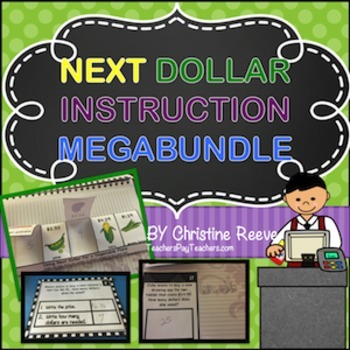 This package of foldables (good for interactive notebooks), mini-books, flip books, and task cards contains everything you need for step-by-step instruction of the next dollar up strategy for single item purchases using $1, $5, $10 and $20 bills. The product includes teaching programs and data collection sheets as well as step-by-step lesson plans for introducing the skill through mini-books and flip books and teaching the skill using task cards and manipulatives. Materials are provided in color and black-and-white to meet individual student and classroom needs. The next dollar up strategy is used for students who are unable to or have difficulty with making change. It allows students to determine if they have enough money to make a purchase. In the next dollar up strategy, the student counts the number of dollars in the price and “one more for change.” For instance, if an item costs $3.20, the student would circle / give 4 $1 bills. Please see the preview for pictures and a more detailed explanation of the materials included. •	Detailed instructions of the steps of introducing and systematically teaching students to use the strategy with lists of materials needed to be prepared for each step of the program. 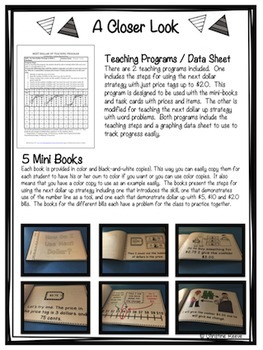 •	5 Mini Books (color and black-and-white copies) presenting the steps for using the next dollar up strategy including one that introduces the skill, one that demonstrates use of the number line as a tool, and one each that demonstrate dollar up with $5, $10 and $20 bills. 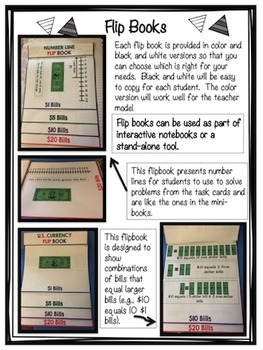 •	1 color and 1 black-and-white flip book with number lines for each amount (less than 5, between 5 and 10, 10-20, over 20). •	1 color and 1 black-white flip book with equivalent amounts for $5, $10, $20. 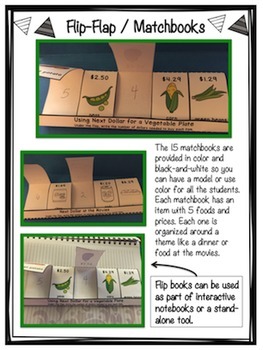 •	15 five-flap matchbooks in color and black and white for interactive notebooks or stand-alone foldables to write the number of dollars under the flap. •	40 task cards (color) with prices in which the student circles the bills needed to make the purchase. 24 cards have prices to $9 and 16 have prices that include using $5, $10 and $20 bills. •	24 black and white task cards (that can also be used in interactive notebooks) that include word problems with the price of 1 item and a 3-step graphic organizer for solving the problem. •	20 black and white task cards (that can also be used in interactive notebooks) that include word problems with the price of 1 item and a 2-step (one step faded out) graphic organizer for solving the problem. •	20 black and white task cards or flip flaps for interactive notebooks with just the word problem with the price of 1 item. •	12 bonus task cards previewing an upcoming product using next dollar strategies to purchase apps for tablets and smart phones.